Why is it that the toilets of every Chinese restaurant that I've been to, in the USA, are by default, disgusting? The US of A is a population of migrants. We have people of descents from all over the world from Italy to Ireland, to England, to Germany, to India, to Iran, just to name a few, as well as us Chinese from China, Hong Kong, Taiwan, Singapore, Malaysia, etc. Everybody brings in something to contribute to this melting pot of culture and we have to bring disgusting toilets. Haiz. Do get me wrong, we did bring positive things to this country like Chinese food (fortune cookie not counted) and Chinese medicine but certainly we can do something about the toilets? Sheesh.... no wonder the bush look so much more attractive as a urinary alternative. p.s. My uncle is sooooo going to kill me for snapping this pic. was the urinal dirty? i didn't think so leh. 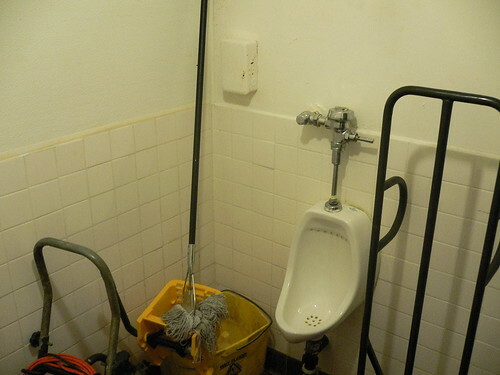 I don't think it's the dirty urinal...I think it's the fact that they've decided to also use it as a storage area for dirty mops, pails and paraphernalia! you are right, a lot of the chinese restaurants over here, although are 'ok-clean' aren't fantastic. they are either too small, too cramp, or have a slightly stale/off smell. gross. maybe the restaurant not particular about cleanliness.. or the country doesn't have an award for the cleanliest toilet for the competition unlike singapore..
tat is your uncle? errrm wat is he doing? Chinese restaurants in LA (especially in the east areas) are usually dirty....and most of the tables are sticky! Luckily I have a friend who's so crazy about hygiene, she wipes and cleans everyone's bowl, cup and chopsticks before every meal! sunflower: Let's just say that for an old geezer over 70 years old, the bladder isn't as strong as before. Hence the need to settle on the spot before he wets his pants. xcake: I was in a Korean restaurant in Atlanta just yesterday. Damn.... they really put us to shame! !